Statues commemorating soccer greats are common on England: Bobby Moore at Wembley Stadium, Matt Busby, George Best, Denis Law, Bobby Charlton and Alex Ferguson at Old Trafford. Bill Shankly at Anfield, even Thierry Henry at the Emirates. Until now, no MLS player has been honored with a statue. That will change on March 2 when David Beckham will be inducted in LA Galaxy Ring of Honor at Dignity Health Sports Park before the Galaxy's 2019 season-opener against the Chicago Fire. Beckham's statue will be unveiled in a pregame ceremony (exact time and location to be announced later). At halftime, Beckham, who played six years for the Galaxy (2007-12) and won two MLS Cup titles (2011-12), will join Cobi Jones, Mauricio Cienfuegos and the late Doug Hamilton in the club’s Ring of Honor. “The LA Galaxy are a very special club to me, so to receive this honor is incredible and very humbling,” said Beckham. “Personally, I will always be eternally grateful for the amazing welcome the club, the fans and the city of Los Angeles gave me and my family from the minute we first arrived. My time playing and the friends we made during that period are so important to me -- and Los Angeles, in so many ways, will always feel like a home to us." Beckham's arrival coincided with the boom in MLS, which had 14 teams when he arrived. 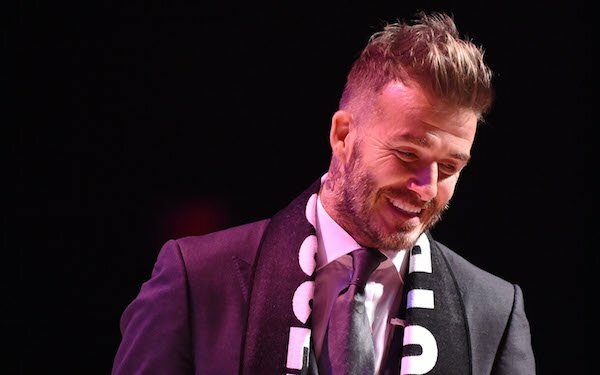 Inter Miami, which Beckham founded and is now a part-owner of, will be the 26th team in the league when it launches in 2020 along with a new team in Nashville. 5 comments about "David Beckham will become first MLS player to have his own statue outside an MLS stadium". beautiful game, February 12, 2019 at 9:56 a.m.
Statues are meant for great players; D.B,, C.J., and M.C.? Ben Myers, February 12, 2019 at 1:11 p.m.
David Beckham, we hardly knew ye as an MLS player. Went once to Gillette Stadium to see the Galaxy and Beckham. Oops! He was injured. Or maybe he did not want to play on artificial turf? As far as I am concerned, Beckham does not deserve a statue in this country. Maybe elsewhere, Man U or Real Madrid or outside Wembley for his English National team contributions. The statue in LA-LA land does puff his ego. There is way too much ego puffery in our world nowadays. Craig Cummings, February 12, 2019 at 9:08 p.m. I would rather see a landon statue there. He was the face of the Galaxy and USA. Bob Ashpole, February 13, 2019 at 12:46 a.m. It is a tourist draw. Right Winger, February 14, 2019 at 11:02 p.m.